Within its walls, people talk and kiss, laugh and cry; some are glad to sit alone, while others wish they did not. A woman with silver-blonde hair opens her bookshop downstairs, an old man feeds the sparrows on his windowsill, and a young mother wills the morning to hold itself at bay. Though each of their walls touches someone else's, the neighbours they pass in the courtyard remain strangers. 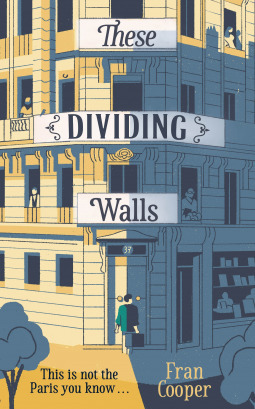 I found These Dividing Walls both a delightful and thought-provoking read. On the one hand it is the tale of a disparate group of people, all dwelling within the same Parisian apartment building, all with their own worries and hang-ups; on the other hand it is a thoughtful commentary on the issues facing us in current times with regard to hatred, fear, and intolerance. The characters are all beautifully drawn, and the social commentary weaves effortlessly through the story without being too 'in your face' or preachy. I found this book difficult to put down each night; I was so taken with the characters' stories, wondering what would happen to them next. These Dividing Walls is a wonderful literary fiction work that can be read as either social commentary or a simple tale of the interactions between a group of very different people and their various reactions to the same situation.